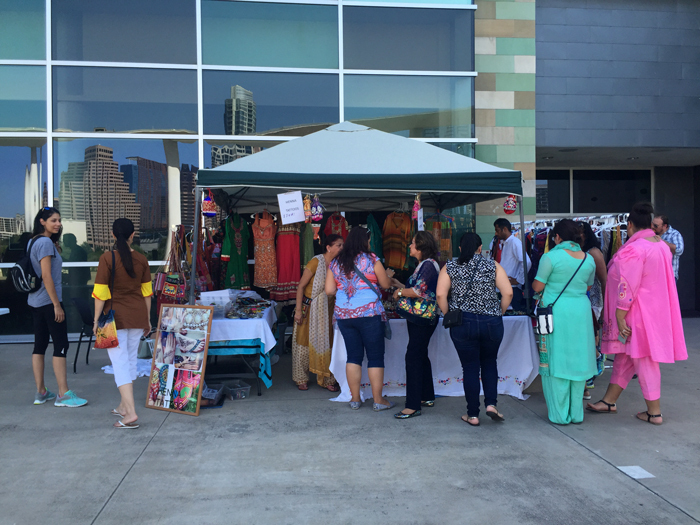 Austin Bollywood Day 2015 was a success! While the weather was exceptionally hot, hundreds of visitors were in good spirits while checking out the festivities at the Long Center. If you missed this recent August event, don’t worry. There are several happenings throughout the year to celebrate the vibrancy and excitement of Bollywood in Austin, and you can get involved. The name “Bollywood” comes from combining “Bombay” (former name for the city of Mumbai) and “Hollywood.” It refers to the Hindi language film industry (there are numerous other film industries in India representing other languages). When people talk about “Bollywood dance,” they’re referring to the dancing seen in Bollywood films. The music can be of many genres, so the dancing technique lends itself to hip hop, contemporary, jazz, folk and so on, depending on the music genre. I spoke with Prakash Mohandas, a founder of Austin Bollywood Day, to find out more about Bollywood related activities in Austin. 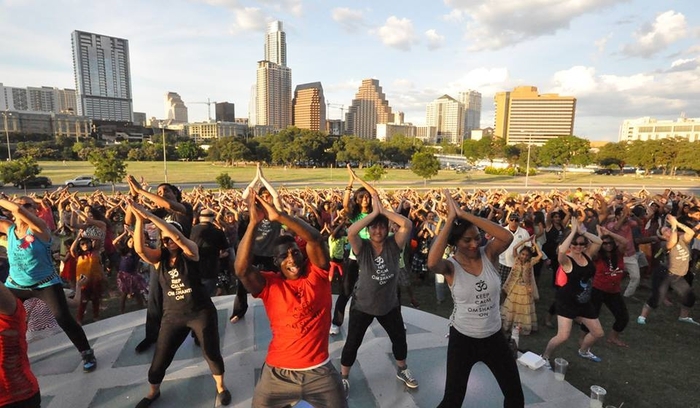 This was only the second Austin Bollywood Day, and the first time the city officially proclaimed the event. 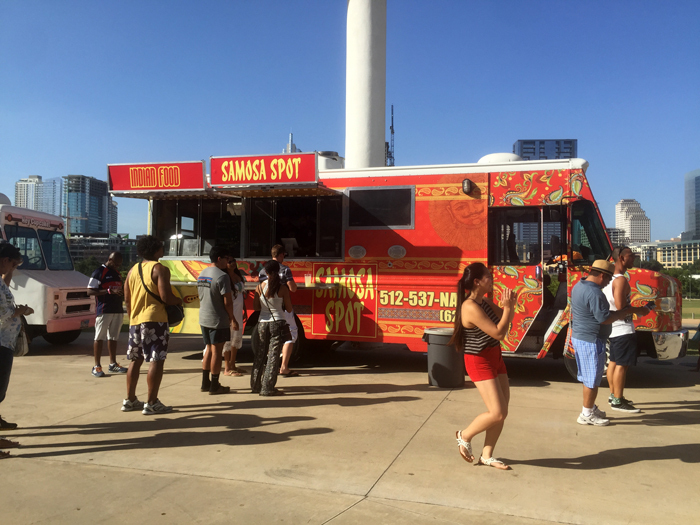 Food trailers, accessory and clothing vendors, pulsating music and a henna artist were all in attendance. Every hour, there was a dance tutorial leading up to a world-recording breaking attempt to have hundreds of people dancing the same Bollywood dance (to the best of their ability). In the afternoon, there was also a procession of drumming and dancing from the Capitol to the Long Center called a baraat. This practice usually involves the arrival of the groom during a traditional Indian wedding ceremony. Prakash’s goal with the event was to give visitors the opportunity to enjoy Indian culture, spread the word about Bollywood dance and movies and help local artists gain an audience for their endeavors. All ages and ethnicities were welcome, and you didn’t even need to be a good dancer to participate! 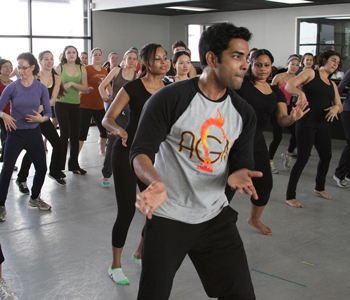 Those who enjoyed the dancing (which was everyone I saw), can take dance classes from Prakash and his colleagues at Agni Dance Company, the first Bollywood dance company in Austin. Prakash founded it in 2007, before the success of Slumdog Millionaire and before Bollywood became a dance category on the popular TV show So You Think You Can Dance. Since the release of mainstream Bollywood-inspired entertainment, interest in Bollywood dance has grown significantly in Austin and all over the U.S. Classes and workshops are periodically offered at Ballet Austin and the Long Center. 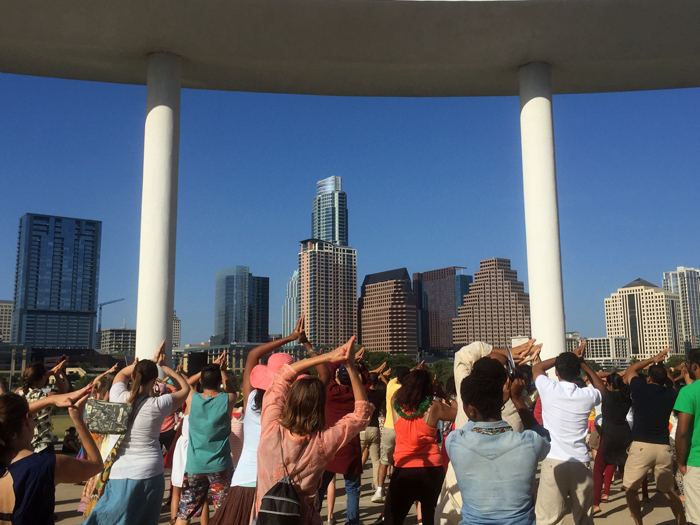 Coming up on August 30th, Ballet Austin is hosting “Come Dance!”, a free day of dance with Bollywood included. If you aren’t looking for lessons, there are other Bollywood events to keep your eye on. In 2013, Agni Entertainment presented the completely locally made musical, Om Shanti: Once Upon a Time in Bollywood, which is now touring the country. The dance company anticipates producing more musicals to showcase the talent in Austin–hopefully one every year! Follow Agni Entertainment on Facebook to make sure you don’t miss these incredible local productions. If you’re interested in a high energy club event, follow DJ Nish, the resident DJ at Austin Bollywood Day 2015. He throws “Austin’s Biggest Bollywood Party” every few months. I had a blast during Austin Bollywood Day. The music, beautiful sights and high energy made it a memorable event and a little peek into the world of Bollywood. I may not have caught on to the dance 100% or even 75%, but that just means I have room to improve next year. Have you attempted a Bollywood dance?